Here you'll learn all about the dual team of Jody and Deanna, and many others from various doll clubs, our interests and hobbies, and more. Many special thanks to contributors Pam, Cindy and Shirley for hunting up pictures of dolls and getting them in to us to use on the site. They are wonderful! This site is under construction by many helping hands, with doll pictures from personal collections, auction pictures, and catalogue pictures. At this time, there are NO dolls on this site that are for sale. This is an INFORMATIONAL SITE, based on research and a lot of hard work. If you have doll pictures from your collection that you would love to share, just email this site and the information will be gladly added to the site, for other's information, and research. 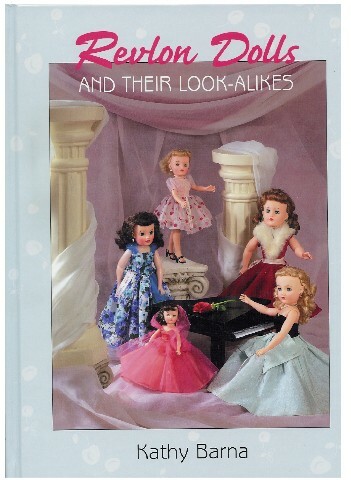 These are the gorgeous Horsman fashion dolls, but more will probably slip in as time goes by ...needless to say, most web sites start that way. 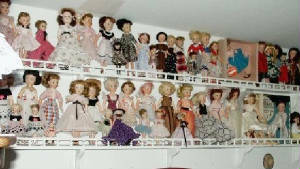 And Deanna's wall of dolls shown below, also has Cindy's all over it also, and no doll collector is not hooked on other fashion dolls as well. Her dolls are scattered all over also, so you can see them everywhere you look. box, they never have a life." Don Jensen, Author of the Beautiful and Historical book called "Horsman Dolls 1865-1950" has also written another book about Horsman from the 1950's and on. 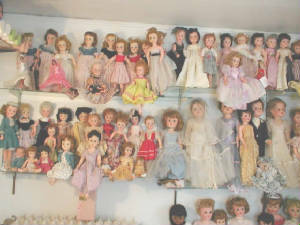 A few of the dolls in this site would be in it along with countless other Horsman dolls that are so darling, yet so little known about them. Hence, the reason for this site on Cindy. Don has conducted many hours of thorough investigations and interviews. We loved seeing this book published. If you read his first book you will know just how accurate this man is. His new book came out last year. With little information out there, it is hard to say with a few of these outfits if they are possitively Cindy Horsman outfits. If you see an outfit you are certain belongs to another doll, please let us know. This will give us further information we are looking for. Many of the Cindy dolls are Marked Horsman 81 for the 15", 82 for the 17-18" and 83 for the 19". They are always marked on the back of the head, and while the numbers usually hold true to the sizes, there are some cases where they cross over to the other sizes and styles. 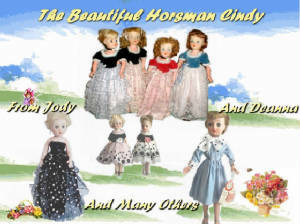 The 10 1/2" Cindy dolls are usually marked Horsman. $35 per book, Shipping on first book is $3 add $1 per additional books ordered.